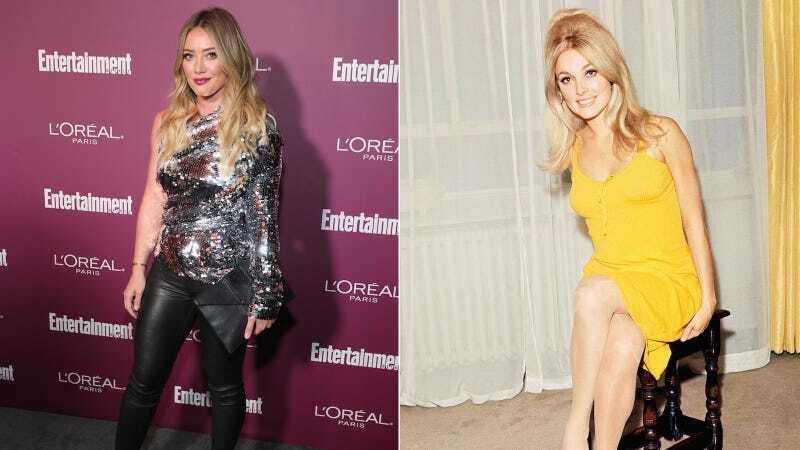 Hilary Duff has been cast as Sharon Tate, the Valley of the Dolls star horrifically murdered by Manson family members in 1969. The film, written and directed by Daniel Farrands, takes a look at the last days leading up to Tate’s murder from her point of view. The plot is inspired by an actual quote from Tate, from an interview published a year before her death, wherein she reveals having dreams about ghosts haunting her house and foreseeing her own death at the hands of a satanic cult. This is not the only Manson murders movie in the works. American Psycho director Mary Harron is making Charlie Says with Matt Smith (???!!!) starring as the man himself. And of course Quentin goddamn Tarantino is also making a movie presumably about Manson, due to be released on the anniversary of Tate’s death, a ghoulish move. You could also just listen to the Manson season of You Must Remember This and call it a day. A fun fact about Hilary Duff and movies at least loosely based on the lives of real people: Back in 2009 she signed on for a Bonnie & Clyde remake that never got made, and in that time, she got into a feud with Faye Dunaway.